Samsonite Omni PC 68311 is a sleek and modern luggage set of three pieces of 20, 24 and 28-inch suitcases with spinner wheels. This imported luggage set is one of the best selling on Amazon.com at the time of this review. You are given nine different color choices of black, purple, navy, pink, radiant pink, teal, Caribbean blue, Reg Caribbean blue and burnt orange. 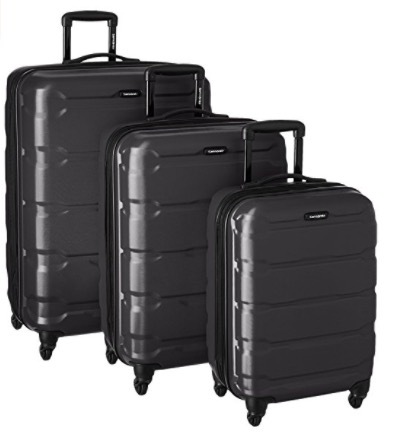 The spinner wheels on all three sizes of luggage are lightweight and redesigned over the older style wheels. They rotate 360-degrees in multiple directions and they will let you move the suitcases easily and effortlessly. They are made of hundred percent polycarbonate with nylon lining and zipper closure. You have the cross straps and full zip divider inside so you can better organize your stuff. You are guaranteed that the surfaces will be free of scratching after many travels, thanks to the scratch resistance of the micro-diamond texture and the polycarbonate construction. They will hold up quite well to airline and airport staff abuse and will look as brand new after many trips. These are lightweight yet heavy duty suitcases that will provide great protection for your belongings. You can expand all three units on both sides for extra storage capacity. They include the side-mounted TSA locks which are safer than ordinary locks. You can set the combination locks to your own code and the TSA staff can inspect the contents of your luggage without damaging the lock. Samsonite is a global leader and a very well known brand for quality, durability, reliability, functionality, design, and innovation. And the company has a variety of backpacks, travel accessories, casual bags, laptop bags, electronic carriers, and luggage. You can have a peace of mind when you’re traveling with a Samsonite product. The package carries the three suitcases stacked into each other and the whole thing shipped weighs 30.4 pounds and measures 28.5 x 20.5 x 13.5 inches. They nest inside each other nicely when you want to store them as well especially if you don’t have much space in your flat. The three suitcases in the Samsonite Omni PC 68311 3-Piece Luggage Set are nice looking, great quality, sturdy, strong, spacious, lightweight and super easy to move around. As a minor con, please note that the telescoping handle on the 20-inch cabin size luggage extends out in two pieces. And this makes it feel less stable than the one-piece telescoping of the larger units. This is a great quality set that is offered with an impressive 10-year warranty by Samsonite.